By now, unless you're working at Urban Outfitters, there is a good chance that your business is struggling. Let's review seven scenarios (inspired by Multichannel Forensics) that help the business leader understand what is causing the implosion of a business. Scenario #1 = Across The Board Loyalty Decline. In this scenario, customer retention is down, spend per buyer is down, and there is no file momentum. This business is down 33% to last year because the sky is falling. 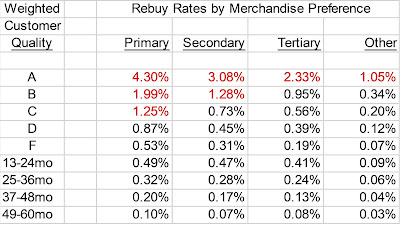 HHs Rebuy $/Buyer Net Vol. Tot. Vol. Scenario #2 = Fewer Loyal Customers Buying. This scenario is common, and while not as troubling as in Scenario #1, is very troubling. Given the choice between customers and spend, always take the side of having an increase in customers. Scenario #3 = Customers Spend Less. This is bad, but not as bad as Scenario #1 or Scenario #2. Customers are just spending less than last year, giving you hope that you at least still have a loyal customer base. Scenario #4 = Lack Of File Momentum. This is likely to be a big problem in the second half of 2009 or 2010. At some point, the economy will recover, but we won't notice the recovery because we don't have enough customers to fuel growth. Scenario #5 = Reactivated Customers. Take a look at how well you are converting customers who last purchased 13-60+ months ago. These customers sometimes foreshadow future problems among loyal buyers. Scenario #6 = New Customer Acquisition. Before this economic downturn began, catalogers realized that customer acquisition was imploding. Customer acquisition is a leading indicator of future business performance. Pay close attention to upticks and downturns in the number of new customers, by source. And always remember that customer acquisition fuels our businesses, regardless of what the loyalty punditocracy communicates. Scenario #7 = Implosion. 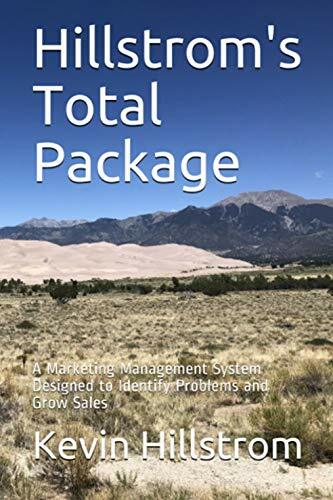 Implosion occurs when we fail to have file momentum, when repurchase rates are down, when spend per purchaser is down, when reactivated customer conversion is down, and when new customer acquisition is down. Implosion fuels layoffs, layoffs fuel decreased spending, decreased spending fuels implosion, a recipe for disaster in 2009. And here's a little nugget of information --- nobody is going to bail out the $10,000,000 online pureplay or $30,000,000 cataloger with a hundred year history of running business with honesty and integrity. So we have to fully understand the implosion scenario before it hits really hard. If you are a business intelligence analyst or a web analytics expert, you have a fiduciary responsibility to communicate the manner in which your business is dying, so that your Sr. Leadership team can begin to take steps to improve business. The days of sitting around monitoring the conversion rate of customers arriving from MSN are over! For instance, if your brand lacks file momentum, then you do not have a merchandise or creative problem --- you are simply struggling because your business struggled in the past --- you do not need to re-invent your merchandising or creative or pricing strategy. But if your business is stuck in Scenario #1, your management team will need to re-energize the brand. So let's figure out what is ailing our business during this unique time in history. Great post Kevin immediately useful. Thank you sir. It's always good to take a peek at what the customer base is telling us!